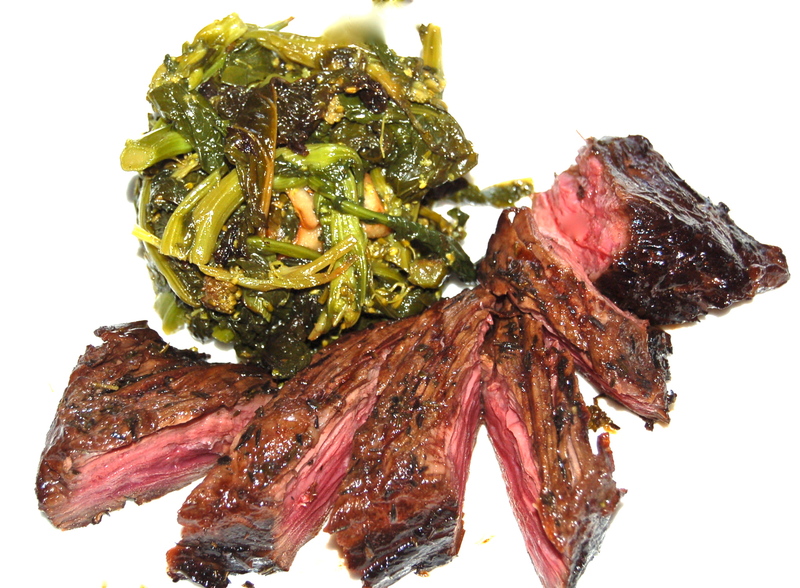 The Hanger Steak, also known as “The Butcher’s Cut”, is a thick strip of meat from the underside of the beef cow. It hangs (hence the name) between the rib and the loin. It is part of the diaphragm and is full of flavor but can be tough if not marinated in a mixture that permeates the meat and breaks down the connective tissues. I marinated these overnight, and while they still weren’t quite as tender as we like, the flavor was excellent. 1. Marinate overnight or for 24 hours. 2. Heat the oven to 400 degrees. 3. Heat a cast iron grill pan to smoking hot. Add the Hanger, weighed down with a grill press, for 2 minutes a side. Move the pan to the oven for 3 minutes. The internal temperature for Beef should not exceed 125 degrees for a juicy result. 4. Serve with an accompanying bitter Green such as Broccoli Rabe, Kale, or Escarole for a hearty, healthy dish.